Interested in the neuro-biology of how you can become more resilient to stress? Listen in. Get in touch if you want some citations to the research that went into this episode - I'd be happy to send out the citations. As a great, readable reference, check out 'The Hour Between Dog and Wolf' - it's a great look into the neurology of risk. Music by Big Rain courtesy of Mevio's Music Alley. Have you ever climbed or shredded on mountain bikes with those people who - by some act of ultimate willpower and control - never bat an eye at stuff that makes you wish you had worn your brown pants that day? I have encountered a lot of those people. And I always wanted to figure it out - what the Hell is their secret? Are they born with a genetically-predisposed aptitude for risk? With the ability to calmly handle anything you throw their way? The recent research suggests that while we can indeed be born with a wide range of reactivities to dangerous situations (I talked about this last episode, What adventures are you wired for? ), we also have the ability to develop mental toughness through practice and lifestyle design. Surprisingly, developing it may even help us to live longer, healthier lives. Stress. Quick - what does the word make you think of first? Work? Drudgery? Relationships? Heart attacks? (yes, it has come to my attention that heart attacks are caused by stress potentially as much as by dietary factors.) Ughhh. Stress can be a good thing - it can help us grow. But today, it seems that the word is only associated with the long-term, catabolic and insidious stress we find in so many modern workplaces. Last week we talked about resilience, both personal and societal. How can we as individuals and as a community learn to respond to unwanted change in a way that allows us to continue living our core purposes? I mentioned that we would do a couple of episodes really diving into some of the science behind how to develop resilience and live a stoked life. This is one of those. What happens to us, biologically, when we are stressed? How is it that stress causes heart attacks? How can we learn to mitigate the stress response in our bodies to live healthier, longer, more productive, more awesome lives? When someone says ‘I’m stressed,’ what they are referring to is a set of conditions in their body that came on in response to some external or internal stimulus. Perhaps their company is laying folks off left and right, and they fear they may be next. The set of conditions that they are feeling in their body are a totally normal response to threats. If we go back to how we, as humans, evolved, lay-off’s weren’t a huge concern for cave men. Instead, a bear or lion might have been our biggest concern, or a rival tribe. These stimuli would require a great physical effort, so the stress response evolved to cause a rapid shift away from the state of everyday affairs in our bodies and brains to a state of emergency, allowing us to run or fight for our lives. Cool stuff - and it saved our asses out there on the plains. In the workplace though? Well, let’s get to that in a minute. The stress response in the human body occurs in four stages - the last stage being the differentiator between ‘good stress,’ or eustress, and ‘bad stress’ that makes us weaker rather than stronger. The first two stages involve electrical signals and are thus extremely fast. First, a small portion of the brain called the amygdala must register the stimuli (‘that’s a bear!’) and assign it emotional significance (‘I don’t like bears because they are dangerous’) before sending it out to other regions of the brain. This process takes milliseconds. The second step is for the message to be sent to the body’s visceral organs - the heart increases it’s rate, pumping more blood and increasing blood pressure in case we have to sprint away. The extra blood is sent towards major muscle groups in our thighs and arms. At the same time, blood vessels in the stomach constrict, stopping digestion since there is no need for it lest the lion actually catch us. The blood shunted away from the stomach can result in the feeling of butterflies. Tiny arteries in the skin also constrict causing the skin to be clammy and pale - if the skin was lacerated in the fight this would help to slow bleeding. The skin sweats even in anticipation of physical exertion while water is conserved by stoping salivation, resulting in a dry mouth. All of this occurs in less than a second and can prove extremely useful in getting away or fighting a threat; the downside, though, is it takes a TON of energy. There needs to be a way to fuel the process for a longer amount of time, and this is where step three comes into play. The third step in the stress response is no longer electrical - it is chemical, which means it takes much longer for it to occur - on the order of seconds to minutes. The chemicals enter the body in the form of hormones like epinephrine (adrenaline) and sustain the focused attention and energy in the body. The fourth and final stage in the stress response involves threats that last longer than a simple fight-or-flight situation. To deal with this sort of a sustained effort, the body secretes increasing amounts of “the big gun” of stress response - cortisol. Cortisol is a catabolic hormone - it is capable of breaking down energy stores in our body so that we can use them immediately by blocking the effects of insulin and turning fat and muscle cells into free fatty acids and amino acids, which typically get sent to the liver to be converted into glucose so that our body can get immediate energy. It inhibits digestive enzymes to further slow digestion, and it inhibits the production of growth hormone (which can actually stunt the growth of young adults exposed to stress). Similarly, it blocks the effects of testosterone and suppresses the reproductive tract. Finally, cortisol is an incredibly powerful anti-inflammatory which, in combination with endorphins released can dull pain. As a result, cortisol is capable of producing invigorating effects on the longer scale of minutes to hours... or even days. And this is where the problem lies - the effects of cortisol are capable of saving us from quite a bit of danger in the short term, but sustain the effects of cortisol for too long and let it reach too high of levels, and we may as well guarantee our long-term demise. Unfortunately, our bodies treat threats in the form of a fight and in the form of workplace stresses the same. Ever gotten butterflies and sweaty palms before giving a speech? Even more unfortunate is that workplace stress tends to always be long-term. So let’s talk about some of the effects of chronic exposure to cortisol, and then we will finish up with some of the current research on ways to become resilient to stress. Cortisol has been shown to effect memory and thinking - remember our discussion of the amygdala - the part of the brain that gives emotional meaning to things? Cortisol can help to imprint and store memories of threatening stimuli in the amygdala, which allows those memories to be called upon in other times of threat to see if there is a match. The result is that under high levels of cortisol, we increasingly remember events that were stored under its influence - which typically aren’t pleasant memories. Perhaps we recall the ex- that cheated on us or a mountain bike crash that required a hospital visit. These negative thoughts also lead to a negative take on risks, which can lead to risk aversion (we’ll talk later about how taking positive risks changes our biochemistry in an awesome way). Once in this state, negative rumors (I heard I am going to be laid off next!) take hold easily, further elevating cortisol levels. This in combination with another hormone released in the brain along with cortisol called CRH creates anxiety and what is called anticipatory angst - a general fear of the world. One of the unfortunate results of this state can be ‘learned helplessness’, where a person will give up on the idea that they can control their own future. Does this sound like some 9-5, stressed employees you know or have known? Many people exposed to chronic stress find themselves with colds and flus often because of cortisol’s effect on the immune system, with gastric ulcers because of the blood shunted away from the digestive tract, with drug addictions because of cortisol’s effect on dopamine, even with ED because of the reduction in testosterone. But perhaps most common of all, people find themselves with an increased risk of heart disease. This starts with the fact that the heart rate is increased so as to supply more blood to the extremities (so you can run or fight), but the arteries in the interior of the body close down as to stop excess bleeding if wounded. The extra pressure from the increased heart rate and constricted arteries cause tears in the artery walls to occur, which when patched by white blood cells, form plaque. Eventually, a buildup of plaque leads to a clog... and, well, I think you know what happens from there. So what do we do? Can we have the best of both worlds - a job (perhaps even a stressful job that makes LOTS of money) and still not be phased by stress? I think you know what I’m going to say. The answer is yes. Recent research is also proving this to us. It turns out that the physiological and psychological elite - think Alex Honnald or Conrad Anker here - don’t even need cortisol much at all to manage stressful situations. Instead, their bodies are able to rely on another little-known stress-response system in the body - the vagus nerve. The vagus nerve is the largest nerve in the body, emerging from the brain stem and heading all the way down into the core of the body, ending in the gut. Now, this nerve has a whole host of what I would consider to be unbelievable talents that we are just beginning to learn about. The Vagus nerve can do everything from modulating the tone of our voice to slowing our breathing and heart rate. Perhaps even more interestingly, the part of the brain stem that it connects to controls our facial muscles, which allows the vagus nerve to link our gut feeling, heart feeling, and lungs to our voice tone and facial expression. It is this same linking function of the vagus nerve that allows us to have ‘gut feelings’. Some experts like Michael Gershon have even called this connection ‘the second brain’. But of more relevance to our topic, the vagus nerve, much like a downhill mountain biker feathering the brakes to modulate his speed, can slow our heart rate and breathing. This vagal brake is being feathered, slowing our heart rate down, most of the time - after all, there is no reason to have a high heart rate while reading, writing, or relaxing. Now, if during the day you are faced with a fight-or-flight situation - a brawl or something - your body will produce all of the stress hormones we talked about previously. But not for something more minor - let’s say asking the boss for a raise. Instead of going into full fight or flight mode, the vagus nerve can simply release its brake a bit, allowing your heart to speed up and the minor issue to be dealt with without going into full alarm mode. The physiological elite - those folks who never seem to be affected by fear or risk - they simply have such excellent vagal tone that even during high-stress situations, they can simply release the vagal brake to push through the task rather than launching into a full, cortisol-driven fight or flight mode. So how can we increase our own vagal tone and ability to laugh in the face of stress? Well, it turns out that since the vagus nerve is directly connected to the heart, vagal tone itself can be measured with - guess what - Heart Rate Variability. I’ve talked about this before. I’ll also put a link into the show notes about it. By training your heart rate variability, you can increase your vagal tone - your ability to deal with the small stuff for what it is - the small stuff. I can’t tell you how transformative training my Heart Rate Variability has been for my mountain biking, climbing, and life. So speaking of that, how else can we become resilient to stress? Well, for one, we can try to limit major causes of stress - novelty, uncertainty, or uncontrollability. But let’s be real - who isn’t going to face one of those things at some point. It would be a pretty boring life without those. So instead, we can become more resilient to stress. And it has been shown that, funny enough, resilience to stress comes from experiencing stress. It’s just that the stress we experience has to be acute. It has to last for a short time period. Just like a muscle gets stronger when you stress it by doing squats and then let it rest, so does our stress resilience get stronger when it gets worked and then rested. So what can you do to expose yourself to stress? Well, for one, take cold showers. It has been shown that in rats who regularly undergo the stress of swimming in cold water that they are able to down-regulate the stress response by relying on releasing the vagal brake in conjunction with adrenaline rather than cortisol, and that they end up being more resilient to future stresses of different natures. Scientists like Dr. Dienstbier goes so far as to make a case for how people who have developed cold tolerance may also have increased emotional stability. And finally, of course, a way to increase your stress tolerance is to get out there. Climb. Scare yourself. Mountain bike. Skydive. Try something new. You just may find your stress-resilience growing stronger. You just may find yourself becoming a changed person. Next time I’d love to get into another benefit of both HRV and getting out there on adventures - the increased aptitude for getting into a flow state - a state of optimal performance. But until then, go on and get out there. And of course, let me know what you’ve been getting yourself into. Climbing... can you think of a more fun way to master your own personal psychology? To calm yourself down in the face of stressful situations? It not only provides useful skills for everyday life, it's also fun. Boom. Don McGrath and Jeff Elison are psychologists, professors, PhD's, and (perhaps most importantly for our purposes) climbers who put their heads together to write and publish Vertical Mind: Psychological Approaches for Optimal Rock Climbing. In this episode, Don, Jeff, and I had a conversation about the mental game involved in climbing and techniques each of us can use to improve and have more fun getting out there. So buckle your helmets and lace up your Sportiva's ladies and bros. You are listening to the Brave Monkeys Speak. I would be remiss if I discussed the topic of adventure without bringing personal psychology into the equation. I know it seems strange. Allow me to explain in Episode 030. One of the most important, foundational principles in understanding yourself for the purposes of personal development and growth is to understand your biological reactivity - are you inclined to seek out novelty or does doing things outside of your comfort zone make you nervous. Your reactivity can also relate to how and where you get your energy - does a shady spot in a park with a book or jumping out of a plane with a parachute give you more vigor for life? It turns out that introversion and extroversion, similarly, are mostly about this precious resource rather than just ‘do you like people or not?’. Whereas extroverts tend to actively get energy from interacting with people, introverts tend to use energy to interact with others and must rest and rejuvenate afterwards. But the intricacies of the topic go much deeper - it turns out that your reactivity and introversion or extraversion can be related, and the reasons behind these phenomena come down to our unique psychological wiring. The work of psychologist Jerome Kagan illustrates this quite eloquently. In Kagan’s famous line of longitudinal studies (perhaps made famous by Susan Cain’s fabulous work: Quiet - a highly recommended read for all human beings), children were followed from birth well into their teenage years, exposed to various novel stimuli along the way. As infants, some 20% of the test subjects had dramatic, noisy reactions to the new stimuli (which could include balloons popping or hearing the recorded voices of strangers), 40% had mild, quiet reactions, and the rest were somewhere in between. Kagan’s prediction - that the babies with dramatic, noisy reactions would turn into the quiet teenagers of the bunch - came true. Why? It’s all about the individuals threshold for stimulation. The babies that had dramatic and noisy reactions to the stimuli had very low thresholds for stimulation - they could be called highly reactive - most everything would put them on edge. On the other hand, the babies that had quiet, mellow reactions to the same stimuli had a very high threshold for stimulation - they could handle much more sensory input without going on overload. They could be called low-reactive. Among those in the field of psychology, the Hebbian version of the Yerkes Dodson Law is well known. Basically, it states that under very low stimulation or arousal levels, an individual will be bored and their performance in whatever task they are completing will be poor. As stimulation and arousal levels go up (whether by an increase in sensory stimuli like popping balloons or an increase in expectation from a boss), performance will begin to go up... to a certain point. After that point is reached, arousal level is too high (the individual is overstimulated or scared) and performance declines. None of us want to be bored or frightened, so each of us seeks out the perfect level of stimulation to create a flow state of optimal performance and arousal. Now, if you were one of the babies that was kicking and screaming when you heard the balloon pop because your stimulation threshold is low (meaning you are high reactive), then you can bet that going to a party with tons of new people and loud noises is going to put you in an anxious, overstimulated state. Does that happen to you? It happens to me. We are the high-reactive folks - the introverts - we choose to get into flow by avoiding louder parties and instead by having meaningful conversations with a close friend or going on a quiet run in the forest. Conversely, if you were one of the babies that was totally fine with new stimuli because you have a high threshold, you are going to choose to find that sweet spot by doing things that increase arousal. That may be attending a big party, or that may be leading a rock climb or skydiving. Now before we go any further, it’s important to note that your unique awesomeness cares nothing as to whether you are low or high reactive, an introvert or an extrovert. As Cain eloquently highlights, each have their powerful strengths, and the world needs both. Take research completed by Professor David Sloan Wilson where he dropped metal cages into a pond filled with pumkinseed fish, whom also have a propensity for finding their appropriate level of stimulation. The bold, low-reactive fish immediately investigated the traps... and caught themselves! On the other hand, other highly reactive fish would go nowhere near the traps. Wilson had to catch them using a complicated netting system from which they could not escape. Stupid low-reactive extravert fish, right? No. Once Wilson had the fish back in his lab’s tanks, the low-reactive fish responded by immediately adapting to the novelty of the situation, eating the food he provided them and thriving in the tanks. The highly reactive fish, on the other hand, nearly starved themselves refusing to adapt to the novelty of the place. All of this is not to say that if you are highly reactive and introverted you will have less success on adventures, which by nature provide novelty and stimulation (I am a total introvert). Instead, this is to say that by understanding your own unique psychology, you can begin to make choices that will allow you to push the boundaries of your comfort zone at an appropriate pace. If you are naturally highly reactive, knowing this tendency will allow you to practice beginning to enter a flow state without becoming anxious and unresponsive. On the other hand, if you are naturally low-reactive and need to seek out thrills to keep from becoming bored, you can practice assessing risk/reward in order to slow yourself down before making a hasty decision. Translate this to mountain biking or climbing: if you are the cautious, reserved type, these activities provide a perfect platform for you to begin to confront fear and develop new, positive scripts to help you push past it. You are comfortable with all but one steep, technical section of your favorite trail? Practice riding down stairs, doing drops, breathing through the entirety of hard sections, and increasing your level of comfort with technical terrain. Then, go for it. If you are the go-for-it, all out type... well, maybe begin to practice slowign yourself down so as to consciously analyze the fall potential on routes, place extra gear, and scrutinize the quality of your placements. When I was first able to achieve a flow state while rock climbing (I have a naturally-wired fear of heights), I realized that I had not only reached a crucial turning point in my relationship with climbing, but also with fear. I knew how to master it. That’s not to say I could master it each and every time it confronted me - it’s freaking hard! But it is to say that I knew how to go about doing it. This was really the spark that lit the fire that is this book. I don’t think it’s a coincidence that when I finally became comfortable leading certain run-out climbs that were within my ability levels coincided with the time I finally was able to commit and clear table top jumps on my mountain bike, and the time I told my employers exactly what I was looking for, on my terms. So what is your personal psychological wiring like? This is one of the first steps in developing personal resilience - next episode we are going to talk about what happens, on a biochemical level, when you are confronted with stress. And, of course, some techniques that you can use to keep your body’s biochemistry working to your advantage. Whether or not you believe in climate change, the world is undoubtedly changing rapidly, and disasters that come in and shake our world up (sometimes literally) seem to be happening more often. Earthquakes aside, though, in 2011 insurance companies were disappointed when after just 6 months, the year proved to be the costliest year on record - a statistic that their research tied unambiguously to climate change. I’ve seen it first hand this year in California, where a record drought has brought along with it fires, mudslides, and other disruptions. Yet, despite these clear warning signs, we as a culture do not seem to be willing or even capable of changing our rampant, often needless consumer-based way of life. Even myself, someone who constantly asks my peers to examine the amount of waste they produce from purchasing packaged foods, well I still burn gas, buy packaged foods (occasionally), and waste water in the shower (when I have access to one). So does quote “sustainability” stand a chance? Probably not. Am I wasting my time and energy promoting sustainable living? Probably. I’m just being real here - I still think people should live sustainably because it makes us happier, but we’re probably not going to get everyone in the world on board and thus save the world by doing it. Which brings me now to why I wanted to talk about environmentalism in the context of resilience. There is a parable amongst progressives in the environmental fields which describes two types of thinking with respect to environmental disaster. Here’s the parable. A whole bunch of people are traveling on a train running along an ocean cliff (let’s say the North Pacific coast). The train was only designed to hold a couple hundred people, but because the company wants to make as much money as possible, there are now multiple thousands of people roaming the boxcars. Even if the train stopped allowing passengers to board, other people want their friends on the train and sneak them on without the engineer’s knowledge. The rails below the wheels are beginning to screech. “Stop the train!” some of us start to say. “Don’t let anyone else on! Tell the engineer!” Some boxcars listen and put a moratorium on gaining passengers, but the train rolls on collecting more people and fares in other crowded boxcars nonetheless. More people rather than less are inviting friends on the train and trying to get monetary kickbacks as well. As the situation becomes more dire, the rails are irrevocably damaged and minutes from collapsing. A select group of people who until now have remained fairly quiet about the number of passengers are clearly up to something now. They know changing the course of the train is a lost cause, and they have been rummaging through emergency storage containers, first aid kits, and luggage. They have created makeshift parachutes, insulating devices, and lights. As the rails split and the train careens toward the dark oceans below, they jump. They wasted no time trying to stop the inevitable, they simply adapted to the changing situation and innovated to survive. The environmental movement, just like a lot of our mom’s telling us to be careful and avoid risks out there - or better yet don’t go out there - has adopted a risk-management system. Eliminate risks, and we have nothing to worry about. But what about when the risks are inevitable or unexpected? The theory of resilience says that risk mitigation is important - very important - BUT that the ability to adapt and thrive when faced with unforeseen, changed circumstances is just as important. Whether we like it or not, risk is a constant in life. So is change. How we respond to them - now that’s what is variable and fortunately, malleable. So what is resilience? Andrew Zolli gives a definition in his book on the subject which I quite like because it combines components of both natural and human-created systems: resilience is the capacity of a system, enterprise, or person to maintain its core purpose and integrity in the face of dramatically changed circumstances. Zolli notes that resilience is not just incredible-hulkifying our systems. We could create a one-inch thick bike tire that no thorn could puncture, but that wouldn’t speak to how fast you could be back on the road after one of the spokes on the wheel broke. Nor is resilience all about redundancy. It’s cool to carry extra tubes because it allows your ride to persist even in the face of a changed circumstance like a flat tire, but they are also heavy and limited. And, they only account for one problem: how many people also carry a spare chain on rides? In a world that is changing as rapidly as the one we live in - not to mention the possibility for it to undergo permanent changes as more and more people join us - perhaps we should start to think seriously about the amount of resilience our society has - or how much resilience we as individuals have. You know what I am going to say: adventure, getting yourself out of your comfort zone, is a perfect way to cultivate individual resilience. The latest research in psychology shows that personal resilience is both teachable and improvable rather than fixed within us upon birth. It is intrinsically connected to not only our genes and personalities, but also our habits of mind. So make sure the habits you are cultivating are adventurous. With this, I’d like to start a series of episodes that explores some of the latest thoughts and research into these habits of mind. In the next several episodes, we’ll try to cover scientific topics like how risk-taking affects the hormones in your body (or, conversely and more appropriately, how the hormones in your body affect your desire to engage with risks) and what are the habits that can cultivate resilience? It will be cool. So listen in over the next couple of months. Vicki Arroyo gives a TED Talk on preparing for our new climate. David Phillips on Mevio's Music Alley! -Mihaly Csikszentmihalyl in is national bestseller, Flow: the psychology of optimal experience. I know we’re all in a minority, but I think I speak for all of us who love to get out there on adventures when I say that I refuse to believe that we have to live life at the manic, breakneck pack the world around us seems to be pushing us towards. I’m sorry I’m not sorry that I like to cook my own food, that I think my coffee tastes better when ground by hand immediately before brewing, and that I enjoy reading an honest-to-God physical book every once in a while - one with no screens or electricity involved. I like my days to feel like they went by too quickly, but the memories to appear to be long and slow. Drawn out, as if somehow in that space, that moment, time has elongated itself and slowed down, each scene lingering in my mind before meandering on to the next, marinating and bringing out each vivid detail and aroma of the place. The kind of thing you just don’t get in an office, when the days seem excruciatingly slow, but the number of moments you remember at the end of the week are virtually non-existent. I have been traveling a lot lately. When I’m not traveling, I just sit there in the city wanting to get away. I don’t dream at night, I just look out over the city skyline, listening to horns and looking at the headlights all bunched together like pearls on a string. And then I go: I find myself watching as the mountains pass by, and the semi’s roll on like stainless steel stallions to the horizon. I find myself wondering... what makes me always want to go, to get away from it all? What makes me sing along to Zac Brown, “this road’s been putting miles on my heart, sweetheart,” and wonder why my heart’s odometer seems to roll in reverse, making me feel younger and less wise so long as the miles are ticking by. Why when I finally reach those places I’ve been going do I act less mature, jumping out of the car and dancing with my stuffed animals - I mean spirit animals - and running around trying to climb on everything in sight? And if the odometer doesn’t work right, does that necessarily mean the car is broken? The answer, of course, to what always makes me want to go is that breakneck pace our society promotes. It seems that to be ‘successful’ - a socialized definition - you have to be breakneck. There’s a reason for it, too: our forefathers had one task - to make a positive change in the world by improving human welfare through economic gain. The faster they could move, they reasoned, the more economic growth could occur, which should lead to higher levels of human welfare and happiness. But that’s where it seems to me that their reasoning failed. In rushing around at a breakneck pace, they didn’t enjoy life as much. There was always just one more business transaction to make or email to send before relaxing with the people you love, or finally achieving something you always dreamed of doing. The extra money, then, doesn’t continue to boost happiness levels forever. Just consult any happiness to wealth study out there - the curve for happiness levels off after our basic needs have been met. This socially unacceptable condition, this disease of getting younger and having too much fun in the great outdoors, whether you call it dirtbagging or just plain ‘ole adventuring, seems to be a revolt against society’s breakneck pace. And my question is, are adventurers like us doing good for society? Can any good come of this revolt? I think the answer is yes. I think why not? I think slowing down our lives, asking what really makes us tick, and getting outside our comfort zones can empower us. It can help us to live environmentally connected, to live connected to ourselves and the roots of our own power. I think we should be teaching our kids to slow down, to kick off their shoes and walk barefoot. To analyze risks and make a decision on when to take positive ones and when to not take them. To dance with stuffed representations of spirit animals often. I guess that last one is optional. The challenge for me is living connected to myself and what drives me, and also trying to do the same thing our forefathers did - create a positive change in the world - while still making a living and avoiding sacrificing happiness OR contributing to the loss of our environmental resources. In choosing a graduate school to attend, I faced a conundrum. I want to make a big impact on the world by studying things that will truly influence the future of society, yet, I also don’t want to feed into the pervasive culture of work until you drop. I think - no I know - I am more productive when I can passionately engage in a problem, but also disengage from it to recharge. This is the classic conundrum faced by pretty much all adventurers. How do we find purpose AND balance in our lives. How do we teach our kids to slow down and actually see and want to protect the natural world around them in a consumer-driven, concrete world full of insidious subliminal economically-inspired messages telling them to literally buy into the current society? And lastly, how do we create resilience to change amongst ourselves rather than simply creating risk-management (sustainability) protocols. Well, I think the answers might constitute a PhD dissertation in itself. But here are a few tips. Actually, 5. Listen in here. Matthew Ebel provided the music via Mevio's Music Alley. David Kroodsma, a Stanford-educated physicist and environmental scientist, decided to embark on a 21,000 mile bike tour in the name of raising awareness for the climate crisis. Can we say wow? Tune in to Episode 027 to hear from him chat about the trip, climate change, and the highs, lows, joys, and challenges of long-distance bicycle touring. Hey ladies and bros - the Brave Monkeys are back. 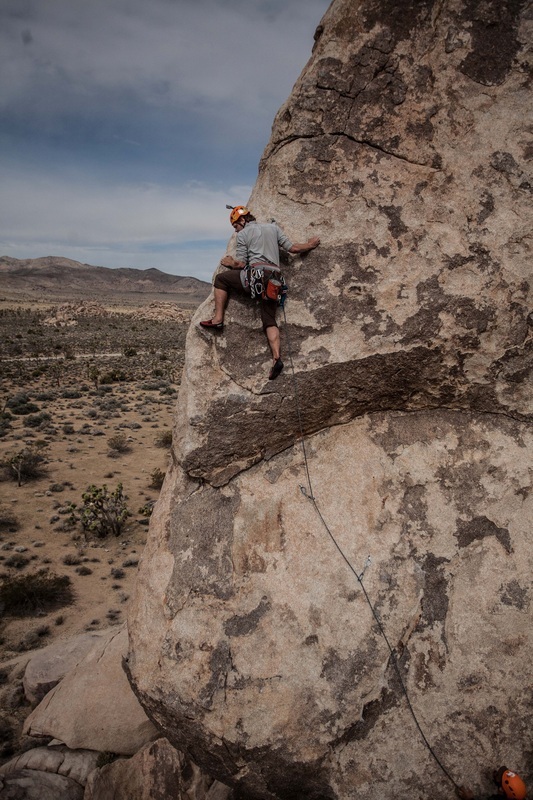 Coming at you this time from Joshua Tree National Park, we have a climbing story. No, a life story. Wait, I'm not sure which one it is. Music courtesy of Holland Hopson on Mevio's Music Alley! Matthew Lee created a monster of a bike ride - the 2,745 mile Tour Divide. Starting in Canada and ending on the U.S.-Mexico border, the route climbs enough quad-burning vertical to be equivalent to summiting Mount Everest seven times. At some point Brendan Leonard interviewed Matt, asking why for so many years he took a month off his job as a maitre’d in North Carolina to come out West and ride his bike an insane number of miles. “Have you heard of The Grand Tour?” he asked Brendan. The Grand Tour was a tradition, almost a rite of passage for young European men in the 1600’s - 1800’s where the men would travel and experience culture far from home. The tradition seems to still have good standing among many contemporary Europeans - just stay a few weeks in the hostels of almost any country in the world and you will find a vagabonding circuit of young Europeans traveling for extended periods of time. But is anybody in the U.S. taking a Grand Tour anymore? Or is everybody doing what they ‘should’ do: going to college, getting a job soon afterward, climbing the corporate ladder, getting a dog, having a family, buying a house, working to put kids through college and get a bigger house with a yard, pushing off retirement for just a few more years to make a bit more money, finally retiring and getting cancer a year into retirement? Life moves at a slower pace on a Grand Tour. Matt says you don’t really hit your stride with that slower pace until day three of a trip, which explains why trying to cram a whole bunch of fun into two- or three-day weekends sometimes feels more draining than fulfilling. The Grand Tour fixes that, it gives us a second to take a deep breath and look around. It gives us a chance to look inward and ask ‘What’s my story?’ It just may give us a chance to uncover our story. It certainly did for Matt Lee. Just read Brendan’s The New American Road Trip Mixtape to find out if he ever found his story. Everybody needs a Grand Tour, Matt said. What will yours be? Are you ready to stop settling and start living? To stop constantly 'playing defense' in life? Are you ready to play to go for audacious goals? Health guru and men's coach Clark Danger and I discuss the value of personal development in creating a freaking awesome life for yourself. Stop waiting for that magical day to come when you are allowed to start living the epic life you have dreamed of. Create it now. Stop settling, start living in Episode 024. Make sure to connect with Clark at ClarkDanger.com and check out his podcasts on iTunes. For those of you interested in diving a little deeper into what happens in the brain during coaching, here is a link to the Neuroscience of Good Coaching - a synthesis article of a recent paper published in Social Neuroscience. Call me crazy, call me masochistic, call me just plain stupid, but I decided to go on a run with Michaeline. That’s right - the Michaeline I spoke of last week - the ultrarunner who only seems to get stronger as she goes. Uhh, just hearing her name is a formidable challenge. My alarm clock rang at 6:03 (I don’t like to set alarms for even numbers), and almost immediately I heard Mikey stirring in the other room. Not 30 seconds passed before she had her shoes on and was at the door: “Are you ready yet?” “Uhhh” I groaned. I’ve first met Mikey in Freshman year of college... but I think we exchanged our first words two years later when we both worked at a geology lab at Woods Hole Oceanographic Institute. We became fast friends... and that’s when I first noticed her strange habit: she came to work after having run at least ten miles, and headed off after work to run another ten. I mean, she was on the track team and all, but still, it seemed a little excessive for running the steeple chase or a 3k race. I tried to go on runs with her sometimes, but was dropped in approximately 1.3 seconds. She did her best to make me feel good - she said she wanted to work on sprint training with me, and as a recovering football player, I knew my fair share about sprint training. So we began. And I noticed something even more peculiar about her. In a 40 yard uphill sprint, I blew her away. Again it happened. I gave her a 5 yard head start, same result. 7 yards, 10 yards. I was still passing her. The thing was, her top speed just wasn’t that fast... but she could hold it for miles. And that’s just what she began to do on this dark, rainy morning in Berkeley. The feeling of running in the rain was actually quite liberating, but as I struggled to regain my breaths, the classic old thoughts began to creep in. Why am I doing this? We veered off road and started up a muddy trail in the dark, our feet sinking into the soft earth as the trail began to ascend. And ascend. We climbed, climbed some more, and reached areas where we started literally climbing. I grabbed onto roots and clumps of grass, using them to essentially slab-climb up the trail - the difference between this and true slab climbing, of course, was the fact that I couldn’t trust any feet. Mud gave out beneath each step as I clawed my way uphill next to Mikey. Eventually, though, she found her footing and trotted on. I continued to slip and slide, finally reaching a 10 foot section that had no good roots or holds. I made a go at going straight up it quickly, but slid back down, covered in mud. Mikey had noticed my lagging and customarily turned around to run back until I met with her. I was determined to get up the section, though, with no help, so I ran towards the side of the trail, kicked off the mound and lowest branch of an innocent tree, and leapt for a clump of grass at the top of the section, just barely catching it with my hands and hoisting/mantling/rolling like a beached whale on top of it. Mikey laughed, turned, and ran on. For the first time in quite a while, I felt like the out-of-shape fat guy once again. whew. The trail flattened out for a bit and came to a divergence - one path exited from the park onto the street, and the other headed straight up. Mikey went straight for the path out to the ... well to my suprise to the street. I got hopeful! I wanted to be done now! She stopped, carefully looked at the sign facing the opposite direction, and said - ‘let’s go this way!’ So straight uphill we went. My calves were slowly suffocating. I was pretty sure they were going to need to be amputated. I wasn’t keeping up with Mikey at all. I wanted to be done running, not just now, but for good. She would run far ahead, and then turn back, meeting up with me again to sprint on ahead. This was both very nice of her and like leading a rabbit on with a carrot on a string - every time I thought ‘this is the time I’ll be able to keep up with her!’ and didn’t. It’s about time I heeded my own advice, right? I reminded myself - just find a process to focus on, and trust the process. It doesn’t matter what the rest of your body feels like, just focus on maintaining breathing only through my nose. If you must slow down, so be it. Slowly, gradually, I began to relax and run. To just settle into my rhythm. Maybe I’m being too woo-woo positive and it was actually just that the 14% grade began to gradually reverse its direction. Whatever the case, I trusted the process, and I loved it. I felt strong. I trusted the process, and it set me free. I think we all put ourselves into cages created by our own minds at times. What’s the process you’re going to trust in? Music by David Phillips! Check him out! And like I said, if you have a story to tell, get on the Newsletter by entering your email below and send me the goods! Life's a lot like a wintertime night trail run. The dangers out there are real - very real. But if we act like a Boy Scout, plan ahead and prepare (and act accordingly), most things just aren't as serious as our minds can make them out to be. That's my hope for the current environmental crisis. If we can plan ahead, prepare, and change our actions to reflect greater human health and environmental sustainability, we can turn this ship around, and make these issues less serious than they are looking right now. Today, I present to you three stories of businesses that are trying to create business solutions to human and environmental health. Many of you know that I have a natural aversion to business - I just feel that so often the objective of businesses is to sell people stuff that they don’t need. So at the Outdoor Retailer Winter Market, I really focused on finding the companies that are doing something more, something bigger. Companies that are genuinely helping people lead better, healthier, happier, more productive lives and who, in doing so, are working to help solve the environmental crisis. These are them. First up was Scott Baker from Icebox Knitting speaking about Xob. By using scraps and bits from old wool items that would have otherwise ended up in the landfill, Xob is able to make beautiful, sustainable clothing. Seriously consider getting some of their stuff for your next winter hat rather than a new item from a company that isn't B-Corporation certified. Second was Kevin Brodwick from ThinkBaby and ThinkSport. It's so important that we are using clean products - products that don't have chemicals in them that can disrupt our hormonal balance - which I consider to be one of the most important factors in who we are. Kevin's companies are providing that. And lastly, we had Beth and Sherry from Trust Your Journey. I've often said that everybody needs a community - you will never outperform your inner circle! Trust Your Journey is providing that community for people who need it the most. Positive energy has some amazing, sometimes unexplainable healing powers, and Sherry gives one description of those powers. How many of us have this story: we tried running for years and kept getting hurt? Or we stopped because we felt beat-up physically even though we still had energy? 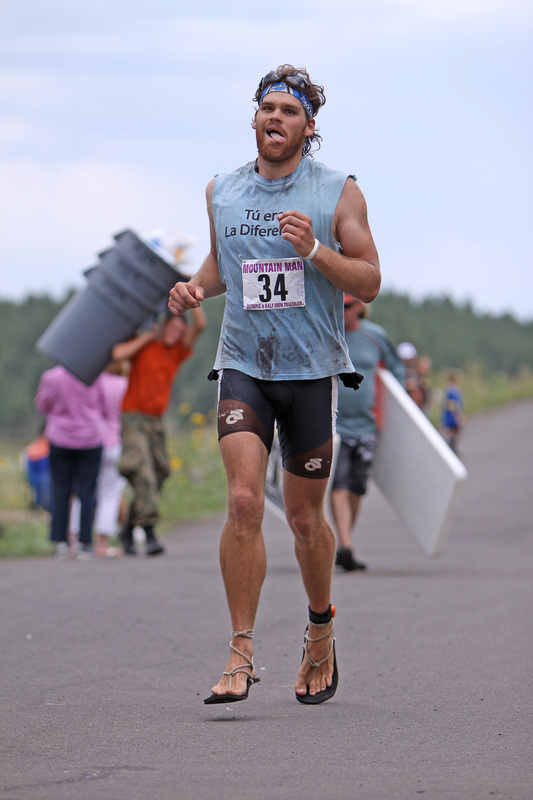 This was my story until I read Born to Run and found Barefoot Ted's journey (check out the photos below!). Similarly, this was Barefoot Ted's story until he uncovered the discovery - or rediscovery - of barefoot running. "Hey! Human being! You know what? You evolved on this planet, and you happen to be the preeminent long-distance moving animal on this planet when you add heat, time, and distance to the equation. And that capacity that you developed was way before anything that we would consider a modern shoe. Indeed, we are ideally designed or created to perfectly move along this planet in a flowing, smooth way with the very default equipment we've been given... you are not born broken." 4. and the foot-brain connection. 5. Finally, we break into Barefoot Ted's latest contribution to the world, providing us with the modern expression of an age-old design: running sandals. Check out The Guide to Minimalist Sandals, make some of your own, and then head over to Luna Sandals to get your hands on some perfection in motion. I am currently walking in a pair of Venado's, running in a pair of Mono's, and soon-to-be hiking/backpacking/approaching big climbs in some Oso's. Tell us what you're using in the comments below? Even better, send us YOUR story via the email list. You're not on the email list yet? What are you monkeying around for? Sign up below. Trying to backpack at 290 lbs, knees hurting. Check out the big boots. "What's the American Dream anymore? Do I have to buy a house, settle down? Will I ever find that girl? Do I want kids? What is home, anyway? A guy told me once that everybody needs a grand tour - some times away from the walls you have constructed around yourself, to shake you out of your routine, show you your real dreams, to show you your story. I found a story. Maybe the only one I really needed"
Make sure to pick up a copy of The New American Road Trip Mixtape and connect with Brendan at Semi-Rad. Seriously, the book was an easy read, and it was life-changing in that it helps us to ask these hard questions and learn to trust in the process of finding the answers. Get a free sticker from me by letting me know when you write a review for the Brave Monkeys over at iTunes. Brendan Leonard is the author of The New American Road Trip Mixtape and writes enthusiastically about things regular folks can do at Semi-Rad. Semi-Rad is what can be done with 52 weekends and a few weeks of vacation a year. It’s adventures for the everyman and woman. It’s a web site for those of us crushing it, kind of. We had a conversation about the struggles of finding work you love, his creative process, and the awesomeness of being passionately mediocre. Music by Jeff Mallon provided by Mevio's Music Alley! If you aren't on the email list, what are you monkeying around for? Enter your email below. While you're at it, go over to iTunes, hit 'ratings and reviews,' and click 'write a review'. Let me know if you did it and I will send you a sticker! Depression has been described as like being trapped in a deep dungeon to which you have the key, but never think you can look for it - or from which you can climb out, but you don't believe you can do it. This is Garrett's story of using adventure to begin to climb out of those depths - both metaphorically and literally. Music today by Zach Schmidt who recently has a new album out! Check it out here. This is the story of how Lyle Nelson deferred Harvard to take a gap-year surf trip through Central America. Strap in. Music today by Zach Schmidt, Shattervox, Jeff Mallon, and Mike McGill. We all make New Year's Resolutions. Mine failed for many years, until I decided to take a life-altering trip. This is the story of my Everglades thru-paddle. Music today by Big Rain, 8 Ball Aitken, Cipre, the Border Blasters, The Delta Rasa, and Jeff Mallon - these guys are awesome! Want to design your life around the outdoors? Look into starting a bike shop. CJ tells us his story today, including his career before bikes, soul-searching on sailboats, and finally opening his shop and having a former squatter in the building become his first 'employee' at Flagstaff Bicycle Revolution. All of the music today was from Diamond Down String Band - CJ's work on the banjo makes their music come alive! Diamond Down is currently touring and looking to put out their first album - if you like their stuff you can get your hands on an album and other extras here! Clay gives insights into health topics like boosting testosterone and reducing toxin loads, why adventure is inspirational and healthy, and his experiences in Zen meditation. And you know me, I also ask him for tips into staying contented with city life. Close your eyes for a few seconds and take a deep breath, then come back and read this. Back? OK, now imagine you are in the Himalayas hiking through deep snow drifts. You are cold, but the air is pure and refreshing. As you take another deep breath, you see in the distance a small wooden structure. Upon arriving at the structure, you realize it is an abandoned Yurt. You open the door and peer inside, and find that high mountain flowers are growing. Close your eyes and take another deep breath, and take in the smell of the flowers and the old wood mixing together. That's where Adventure Tea's Himalayan Oolong comes from, and what it makes you feel like. I have verified it. Alex Davis, the founder of Adventure Tea, tells his story of creation in this interview. He also gives us some descriptions of the varieties of tea that Adventure Tea offers ... beware, though - your mouth may water a bit. During the interview, we enjoyed some smooth, floral Hawaiian Volcano Green Tea, and as I write this now I am enjoying the transcendent Himalayan Oolong Tea. Yesterday I had "The Champane of Teas" - the Washington State White. Can I say WOW!? The beautiful designs on the tea box labels were created by Saskia Bailey, and copy is done by T.J. Lowther. They make for great house decorations after you drink your tea! Make sure to head over to Adventure-Tea.com for the inspiration and this amazing tea alike. The beautiful boxes that come with Adventure Tea! Designed by Saskia Bailey. What do you do after football? Here's my story. I hung up the pads today. Football has been good to me. It has been that extra factor that has gotten me to where I am. But you can’t rely on it forever. Life isn’t football, and football isn’t life. A lot of people lose perspective on that and end up not knowing what they want to do when the journey suddenly ends. There are a lot of things that I want to do with and in my life, and today I will start pursuing those things. For when I read this in the future: remember that statement. If you haven’t yet, do those things. Hike Hadrian’s Wall with Garrett. Paddle Maine’s islands. Ride across the U.S. Write. Learn. Listen. Continue to challenge yourself; get out of the comfort zone. Football. What can you say about it? It’s a game best enjoyed from the stands with a cold beer and friends. But truly, football is like a rose. It’s a beautiful game that will teach you about life, and it is totally glorified and fun to look at. But the thorns will also get you, and they will leave you with blood running down your skin. Deal with it. Whenever I stepped on that field, I always thought of Ivory Christian. I hated the game. I wanted it to leave me alone. Yet, I kept doing it. And, when I strapped up for gameday, the Devil emerged. The mean streak was on; rage in my heart. Today, I leave with nothing but a bag of memories and lessons to carry with me in life (and a couple of stolen t-shirts). And I couldn’t imagine a grander ending. I walked into the bright sunshine and blooming flowers on this beautiful spring morning and I cried with a smile on my face for the memories and the guys who put their hand down in the dirt next to mine. And then it was gone. Even now, only an hour or two later, I can’t cry for it anymore. I am running into the next phase of my life, with a beautiful future ahead. May I have strength and endurance in my journeys. When a lot of guys end their playing careers, its a very emotional moment. There can be lots of crying and thinking about how they will never feel that rush again, that knotted stomach before a game as they go over plays in their head, that moment when the stomach unknots and all that fear turns to anger that swells, making them want to injure anyone in a different colored jersey by any means possible, as long as they don't get caught. And finally, that temporary high after a game, before the swelling and the headaches set in, that moment after a win when they just feel so alive. I took a different path. When I hung up the pads and walked away from the fresh cut grass and dried dirt soaked in my own sweat, blood, and vomit, I had a smile on my face. It was time to be done, and I had and still have things to do before I (get old? Lose function in my knees?). Lots of them. First on the list was get out of the comfort zone and go to new places in the world to learn from new people about different sides of life. I bought a bike to do it. I took a job working in a new place over the summer, Woods Hole, Cape Cod, and I got a lot of traveling by bike in. All over Massachussetts. I fell in love with my steel frame Surly touring bike. The next summer I cut the frame in half and put steel couplers in it so that I could fit it in a suitcase and travel with it without any detriment to the function of the frame, and I took it to Alaska with me and rode across the state. But that’s not what I am here to tell you about. I am here to tell you about athletics. And during the school year I can’t travel with my bike. So I decided to race it. My bike is a steel frame touring bike - probably the last choice of bike for any cyclist to complete a criterium with. For that matter, probably the last choice for a time trial, too, and a hilly road race! The frame is too heavy, the wheelbase is too long, the bottom bracket too low, the tan finish and leather seat are certainly too ugly. When I clipped in for my first race on a slick New York city street in the middle of monsoon-like conditions that foreboded the disasters ahead for an offensive lineman trying to race bikes, my pedals rang like a church bell on Sunday morning. The stiff frame responded to my lightest motion and the unsightly tan frame shone gold. With the shot of a gun we were off… cautiously. Drops of water sprayed in everyone’s eyes, and I tried to settle into a good position about three riders back. At that point in time, I didn’t know about picking and catching breaks, prime laps, or even what a peloton was; I just knew I wanted to ride my bike fast, but that if I stayed behind a few folks I would conserve energy by letting them break the wind for me. For a half hour we went around the track. Near the end of the race the bell rang – I thought it was the last lap. So, after rounding the last soaked sharp corner, I took off. Behind me I heard a Darthmouth rider tell one of his teammates “don’t go for him – it’s not worth it,” which of course seemed strange to me with the race on the line, but I sprinted on and crossed the finish line first. Well, that was my introduction to the prime lap – a lap in which the winner gets prizes or points that, in comparison to winning the race, add up to a fairly insignificant amount. Well, needless to say, the race wasn’t over. As I began slowing down after the finish line, other racers zoomed past me. Surprised, I worked to catch back onto the lead group. Coming around the last corner of the true last lap, I was exhausted! I took fifth. Over the years, I kept racing, getting more and more interested in the techniques and challenge of the sport. I moved up categories; learned about the Peloton, breaks, and more than I wanted to know about external bottom brackets and the physics of radially-spoked wheels; split my face open in a crit crash and had it sewed back together; tried and fell in love with cyclocross racing; had my good races; my bad races; and – eventually – my wins. And through it all, the most refreshing part was that I cycled for fun. I often say that the most fun I had racing was at cyclocross race in which I crashed six times and came in second-to-last. It was a blast! Quite the opposite end of the spectrum from football: people don’t know you are on the cycling team – people don’t know there is a cycling team! For me, there is nothing more refreshing. I guess the old adage is true: you get another hand soon after you fold. Make the best of it, and enjoy it. This time of year, like most Americans I think, I try to take some extra time to think about what I am grateful for. I talk about this a lot, but gratitude itself is actually a powerful lifehack - it has been shown scientifically to help you get better sleep, reduce stress, have better eating habits, and even reduce your feelings of physical pain. I try to take advantage of this nice little fact, so I keep a ‘gratitude journal’ next to my bed - I start every day by taking two minutes to write down three things I am grateful for. This year, though, seems markedly different from years past; I find only one consistent theme from year to year: freedom. In my youngest of years I had a lot to be thankful for, but not that much that I was aware of. I should have been most thankful for my mom and dad’s love and guidance, but I was more thankful for the freedom they gave me on Thanksgiving Day to eat as much as I wanted. I would usually head straight for my Gran’s famous cherry coke salad - a wonderously sugary cherry jello made with coke instead of water, and topped with pecans and real cherries. Well, they were real from a can, but hey, I was 8 so I thought they were delicious. As I reached High School, I continued to treasure the freedom of eating without reserve on Thanksgiving Day, which is probably why I became a football player to begin with. But it was always a different freedom that stood out - football season was over come Thanksgiving. The whole world seemed to open up and possibilities felt limitless - time sprang from nowhere and I could play pickup football on Thanksgiving Day with my buddies - actually getting to throw and catch the ball for once, and being able to run without fear of getting injured for the season in a stupid way. In college, that same freedom was defining, but at a new level as football was no longer a game or even a sport, but a cut-throat business. To have the stress lifted from my shoulders and to see my family and home for the first time in months, to play with our dog, to return to everything that was normal for me was absolute freedom. In the post-college world, freedom seemed as if it would be easy to find as the weight of football - both metaphorically and literally - was gone. But it’s not quite so. Job logistics, financial concerns, family obligations and physical distances all do their part to try to hold you back. As I was trying to figure out how to make my freedom work, I met a great friend and mentor, Peter. At 58 years old, Peter has followed his passions, his obsessions, for a lifetime. He loves to teach, and he loves to ‘go home’. Home, to the Grand Canyon. Since getting home to my family was proving to be challenging, he wondered, did I want to have Thanksgiving with him in his home? The idea was intriguing, but it was different than my classic view of Thanksgiving. I wanted it to be just the same as it had always been - the same food, the same pickup football game, the same home. I guess I had a lot to learn. A greek philosopher said: "You can never step into the same river; for new waters are always flowing on you. No man ever steps into the same river twice, for it's not the same river and he is not the same man." It was different than anything I had ever experienced, and it was freedom in the fullest. There is nothing like taking a poop on top of a giant spire in the biggest, most beautifully intricately carved hole in the world. Just remember to respect the place and leave no trace - yes, pack out your poop, people! I have been thinking about this idea of freedom a lot lately. I have made a deliberate effort in recent years to design my life around service to humanity, and around doing the things that excite me. It’s the ultimate blend of meaning to my life, and freedom. But living this way takes deliberate work. It’s not easy to give up old ideas and accept change, not easy to change the way you view the world or directly fly in the face of what society is telling you you should do. There is an adage from the Wild West: “When freedom is outlawed, only outlaws will be free.” Freedom isn’t outlawed in the U.S., it’s what we should be most grateful for, yet I still think about that old adage. In many ways, society’s preconceptions have caused chasing your own freedom to be unconventional. Rolf Potts notes in his excellent work Vagabonding that “The more we associate experience with cash value, the more we think that money is what we need to live. And the more we associate money with life, the more we convince ourselves that we’re too poor to buy our own freedom. With this kind of mind-set, it’s no wonder so many Americans think extended overseas travel is the exclusive realm of students, counterculture dropouts, and the idle rich.” When freedom is unconventional, only those living an uncommon life will be free. Just as the United States has to work and fight and lay everything on the line at times, for it’s freedom, so do we as people living in the United States. For me, it’s hard to accept change, to lay everything on the line for a dream, for freedom. It’s easy to give in to social pressures or a path of ease and not chase my passions, chase those things that excite me, chase my freedom from a life of ease and drudgery. But every time I do the work to chase it, I realize it’s worth it. 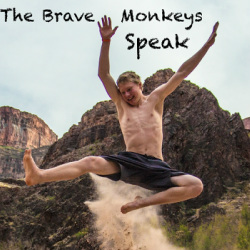 Through the Brave Monkeys Speak Podcast, I am finding out that there is a huge group of people who feel the same way - they work for what they are passionate about, what they see as a life of service to humanity, and when they get tired they renew themselves by chasing freedom through adventure, through getting out of the comfort zone and learning about themselves. We are the people who are alright with redefining ourselves, who are going to redefine the world in the process. Thanks for joining me y’all. Until next time, be well and have happy journeys. If you have a story of inspiration, of chasing your own freedom to share with the community, head over to adventuroushabits.com and share it with us. You can find my email in the top right corner of the site and you can sign up for the newsletter on the page that says ‘free stuff’. We can’t wait to get you on board. Music by Mike McGill and my good friend Zach Schmidt. Former University of Pennsylvania Offensive Lineman and current Houston Law School Student Garrett Moore, who has recently made massive lifestyle changes, lost 40 pounds in 2 months, and upgraded his mental performance before entering law school, lets us in on some of the secrets to his success. Remember that if you want a FREE Brave Monkey Sticker, write a review on iTunes for us, then sign up for the Brave Monkey Newsletter so you can send me a message with your info. Once we have 100 written reviews, we're getting stickers! Music by Uncle Seth and Jim Femino. Thanks y'all! Four years ago, Jason and I met at Woods Hole Oceanographic Institute and started adventuring and "getting healthy doses of unavoidable reality". In this episode, I get off track by telling Jason about a recent story - Canyoneering in Water Holes Canyon - before we get into the meat of the show, using Systems of Decision in Adventure and Life. We also discuss Jason's research into ocean circulation patterns and developing a technology that uses physiological markers to track how far out of the comfort zone you are. We also mentioned the video "Tips for Eating Like a King While Living Like a Tramp" which is live now! On to Episode 009! Music by Black Lab - so awesome. Thanks to Mevio's Music Alley for sharing! Have you thought about trying yoga, but afraid to actually walk into a class? Heather Quinn-Wagner not only gives us insights into the benefits the practice can provide in other aspects of life, but also starts the show off by taking us through some poses! We also discussed the habits you can use to become a writer and the challenges of chasing your dreams. Want to get a Brave Monkey Sticker? If you haven't already, please write a review for the show on iTunes. Then, send me an email with your reviewer nickname and I will put you on the list - once we have 100 reviews I will send out the stickers! Alright - on to Episode 008! Music by Shattervox - so awesome! Thanks to Mevio's Music Alley for sharing it. Thanks for Joining Us on iTunes! The The Brave Monkeys Speak is the climbing, cycling, adventure podcast that's not really about any of that stuff: it's about lifestyle design. How can you design your life around the things that excite you, and get better at your day job as a result? Well, listen up Monkeys. We're speaking.